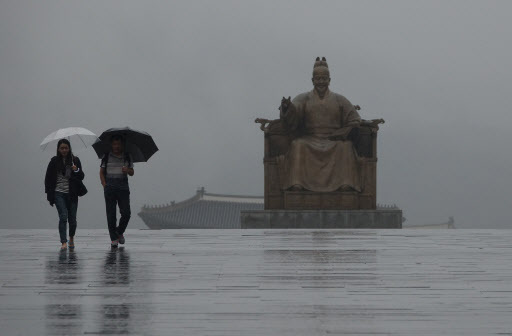 Residents in Korea woke up to rainy weather Monday morning, as heavy rain has lashed the country nationwide. Areas in southern Gyeonggi Province, southern Gangwon Province, North Chungcheong Province and North Gyeongsang Province will receive up to 200 millimeters of rain, according to the Korea Meteorological Administration. The weather agency had issued heavy rain advisories in parts of the South Chungcheong and North Jeolla provinces as of 9:30 a.m. The rain is forecast to cease in the afternoon beginning from Seoul, Gyeonggi Province and Gangwon Province, but start to fall again nationwide Tuesday morning. As the heavy rain cools the summer blaze, temperatures throughout the country will fall. The daytime high in Seoul will reach 27 degrees Celsius, Suwon 27 C, Gangneung 26 C, Daejeon 28 C, Gwangju 29 C, Daegu 29 C and Busan 29 C.